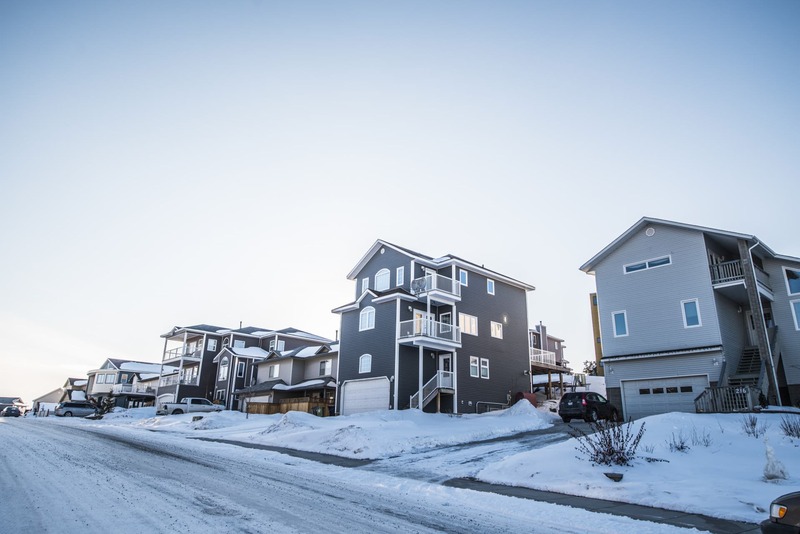 Driving through the looping cul-de-sacs of Niven Lake, you could be forgiven for forgetting that this neighbourhood of high-end builds and twin garages is in Yellowknife at all. Although it’s only minutes from downtown, Niven has a suburban feel that—lake views, hiking trail and snowmobiles aside—could place it on the outskirts of any southern Canadian city. Which is not to say the neighbourhood is drab or cookie-cutter. Sure, it’s short on trees and big on blasting and leveling. But many of Yellowknife’s most “modern,” architecturally forward homes can be found here, with the biggest and most intriguing at higher elevations or overlooking the lake. And, while generally upscale, the neighbourhood isn’t all monster homes built with diamond mine money. The area near the highway turnoff has plenty of doublewide trailers, and there are several apartment buildings, condos and a complex of townhomes. Despite being one of modern Yellowknife’s high-end neighborhoods, the area hasn’t always had the most salubrious reputation. In the 1940s and 1950s, the town’s garbage dump stood on what would become the southern edge of the neighbourhood. And between the late ‘40s and early ‘80s, the majority of the city’s sewage output was pumped into Niven Lake itself. In time, this effluence turned the lake into a uniquely rich wetland ecosystem. But these historical associations have, nonetheless, survived to the present day, and provide ongoing grist for some light civic ribbing. Despite this, the area has always been well-used. For many years it played host to the Yellowknife Ski Club lodge and a wide network of ski and snowmobile trails. For a time, there was interest in mining it, although with the sinking price of gold in the ‘80s and ‘90s, plans to sink a shaft there were abandoned. Today’s neighbourhood is the product of a building boom that started in the late 1990s and continued through the 2000s, driven in part by prosperity from the newly opened diamond mines. Unlike older neighborhoods, which tended to work within the geographical constraints of the landscape, the various phases of Niven were developed with a blast-and-flatten mentality. You can see this ongoing with Niven Phase VII, where a giant pit of boulders and gravel sits between the Redcliff and Cavo condo buildings, waiting to be developed. For a neighbourhood only five minutes’ drive from downtown, Niven is surprisingly tough to access on foot. There are two roads leading into it, one off Franklin Ave. and another off the highway. The road running down to Franklin has sidewalks, but if you take the highway route, you’re walking along a gravelly roadside without well-marked crossing spots. If you’re inclined for a meander, you can also take the scenic trail around Niven Lake, which can be accessed from 49 Ave. There are no stores or restaurants in the neighbourhood. That said, you’re really not far from the downtown grocery store. Or if you’re in the munchies-mood, there’s Sunlines Convenience by the Franklin turnoff to Niven. One of the best features of the neighbourhood is a picturesque trail system around the Niven Lake wetland. The two-kilometre loop of gravel trails, wooden boardwalks, benches a scenic arching bridge, makes an ideal place for summertime rambles or runs. 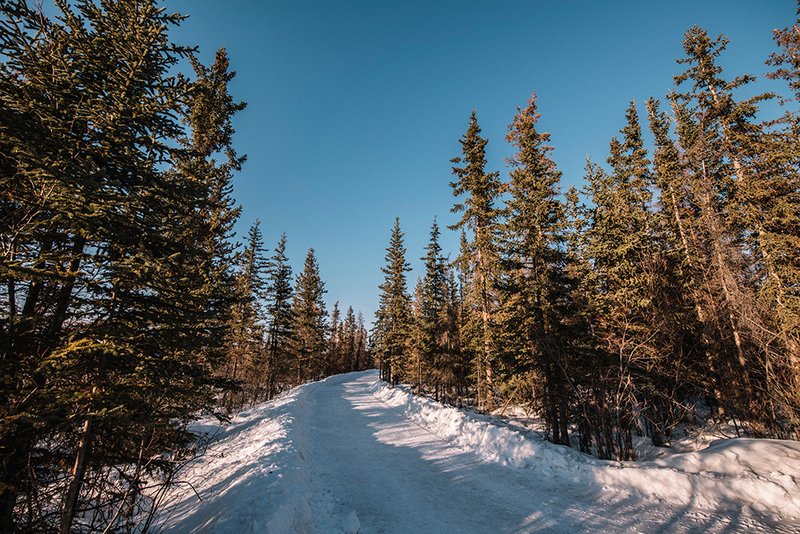 On the far side of the neighbourhood, there’s access to a number of hiking trails that take you along a rocky bluff and down into the ravine between Niven and the ski club. Once Phase VII is complete, the city is planning to lay a further network of trails. At Niven’s centre there’s a small park with a playground for kids, and a second small playground up the road. There’s no elementary school in the neighbourhood proper, but you’re a short drive away from Mildred Hall downtown. Yellowknife’s two high schools, Sir John Franklin and École St. Patrick High School, are likewise a five-minute drive away. There is a daycare, Kid’s Come Childcare, in the Cornerstone Pentecostal Church building.